Once, both of the SSD 4GB and the 8GB were cleared. Android was installed to the 4GB. I made another partition that it's about 200MB from the head. Android is installed in a remaining partiton. The format isn't made of an installer of Android for some reason. To create and format a partition with "GParted"
※ The format of sda1. A picture, Fat32. The case only of Linux is OK in ext2, ext3 or ext4. Android is installed in sda5. ※ The installation which is GRUB2 by the past article, Skip, this time is Yes. After installation completion, once, shut down. Ubuntu install by a USB memory. The point in which you install Ubuntu is to assign "/boot" to the first partition (200MB) and assign "/" (route) to 8GB SSD. 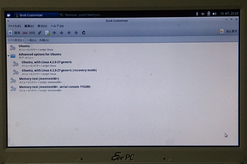 Both of them are formats of ext4. The 8GB also sets up the swap partition of the 1GB, and, "/" is 7GB. At the first, I tried to move another partition with "boot-repair". But it didn't work after all. 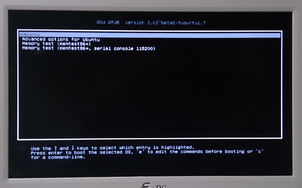 The setting change which is GRUB after a Ubuntu start from a terminal. When it restarts, the menu comes out. But only Ubuntu can be chosen in this case. "grub-customizer" is used to establish it easily. there is a volume with Android in a desktop first, so it opens that. menu.lst is in the grub folder, so that will be opened. 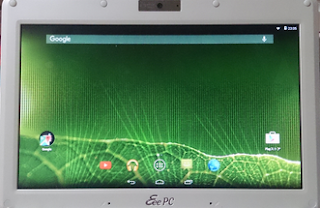 That is the grub menu when you installed Android. Necessary is the line of "kernel" and "initrd". The contents of the "Boot Seauence" of grub-customizer new setting consult menu.lst. Android could be started with no problem.